This A.vogel Echinacea throat spray is specially designed to help soothe a sore throat that is associated with the common cold or flu. Echinacea is combined with sage tincture which when applied to the throat using the convenient throat spray may help relieve sore throat symptoms. A.Vogel Echinaforce Sore Throat spray may be used by adults (over 18 years of age) and the elderly. As a sore throat remedy, apply 2 sprays to the back of the throat, six to ten times daily. Do not breathe in during application. 1ml of Echinaforce®Sore Throat spray contains: 863.3mg of tincture from fresh Echinacea purpurea herb, 45.5mg of tincture from fresh Echinacea purpurea root, 430mg of tincture from fresh Sage leaves. A.Vogel’s Sore Throat spray is made from the well known herbal remedy Echinaforce® combined with Sage tincture and is a herbal remedy used to relieve sore throat symptoms. 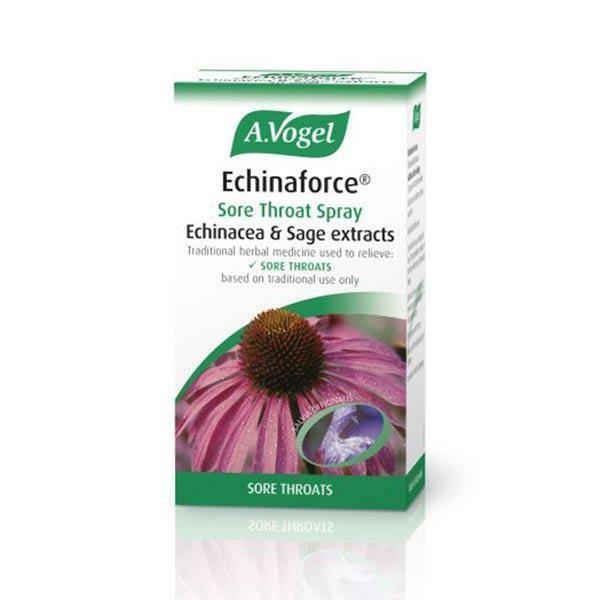 Echinaforce® Sore Throat spray is part of A.Vogel's range of herbal remedies for treating the symptoms of colds and flu. It is available in a 30ml bottle, with a specially designed spray nozzle which delivers the herbal extracts to the back of the throat.